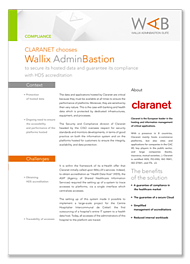 The data and applications hosted by Claranet are critical; senstive by their very nature, they must be available at all times to ensure the performance of platforms. This is the case with banking and health data which is protected by dedicated infrastructures, equipment, and processes. "The WALLIX Bastion has become the benchmark in the e-health market. It is a guarantee of confidence which reassures the customer."